Unique in Birmingham from Shopping in Birmingham on Vimeo. 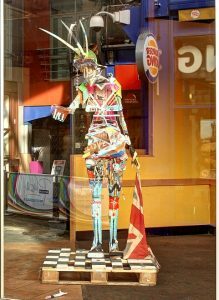 The nine finalists for our ‘Unique in Birmingham’ window dressing competition, designed to improve the street scene around the city centre’s shopping area, have now completed their creative installations and are ready for you to go and explore! 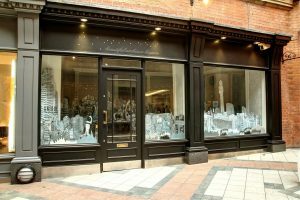 A panel of retail, media and art professionals have taken a tour of the installations and we are delighted to announce that Frilly are overall winners of the competition for their installation ‘Secret City’, taking away £1,000 in shopping vouchers to enjoy in the city centre. ‘Highly Commended’ certificates were awarded to Glenn Anderson for ‘Lost and Found’ and Stitches and Hos for ‘ A Knitted Harvest’. Frilly are a duo of magpies. They like shiny things, making them, sharing them and engaging with them. Adrienne and Kirsty are inspired by people, places, a good story and a sense of history – whether it’s true or imagined. Frilly was established with the aim in mind to encourage participants and interaction. Frilly have invited the people of Birmingham to share with them secrets of their city. 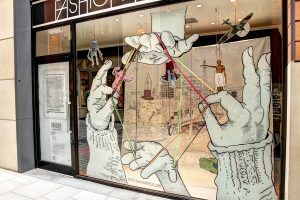 Including truisms and fantasy facts, all of which have inspired 2d imagery used to fill a giant cat’s cradle. Each line of string represents a place in Birmingham signifying how creative Birmingham has become and the connections between these people, places and events. 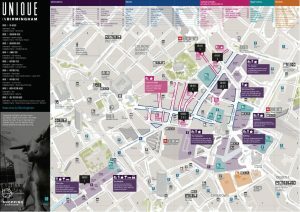 Take a look for yourself at The Mailbox – can you work out which Birmingham facts are true and which are false? Yu-Hsin Chen is an independent designer and illustrator from Taiwan. 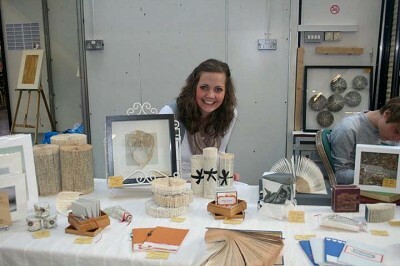 She has spent the last year at Birmingham City University studying for her MA in Fashion Promotion. Yu-Hsin also develops products for Children under her brand name of ZOHOO. 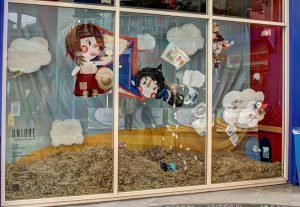 For her latest product collection the designer has created a story under the title ‘The Adventures of Rice Boy,’ and from this her window will be inspired and created. The Adventures of Rice Boy is a fairytale for the public using cute and quirky illustrations and touching meanings. The hope is that by viewing the installation, people can stop and pay more attention to the simple things in life. All of the products used have a close connection with Birmingham, from all raw material suppliers to production processes. Kate Bufton is a book artist, manipulating and transforming old unwanted books into something new and innovative, taking them on an artistic journey and transforming them from a carrier of text to an object of art. From the unknown possibilities and the journey that the book has been on before it reaches Kate, as well as the paper texture and the musty smell, are key factors that drive her creativity. TNT is a collaboration between artists Chris Hodson & Nicole Mortiboys. TNT has been working together (post MA Fine Art, Birmingham City University) for the past three years. Their work consists of flat framed works, moving images, and objects, alongside more challenging forms of realisation. TNT makes upbeat work with a strong design aesthetic and ‘brand’, that is at odds with a lot of more academic based Art. The work is a series of 25 specifically mixed paints, which colours are sampled from the 1956 Hannah-Barbara cartoon, Geewhizzzzzz. The paint is an emulsion, the ‘everyman’ quality of this material creates a frisson between art and life; it’s usage ranging from sprucing up the front room to creating Fine Art. The cans of paint comprise of 3 main elements: the paint, the can and a text label inspiring questions on perceptions of value. Jeremy Rucker is the founder and owner of City Dressing, the leading provider of temporary graphic and light installations for High Streets. 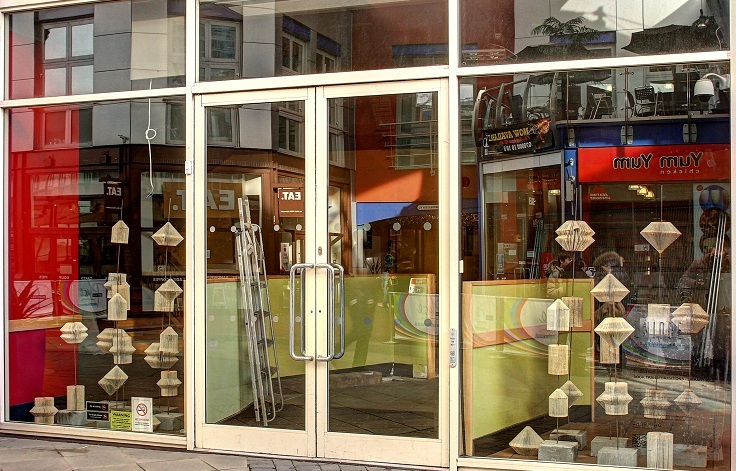 City Dressing has worked with the ATCM (Association of Town Centre Management) for four years to develop an empty shop strategy. The company has been short listed for a number of awards for its work on the High Street. City Dressing has created the ultimate virtual shop. The graphic depicts a working shop of the future using a clever design that only upon a close inspection reveals that it is a virtual shop. The inspiration for the design will be derived by research into current and past designers in Birmingham, as well as ideas of the future of retail. 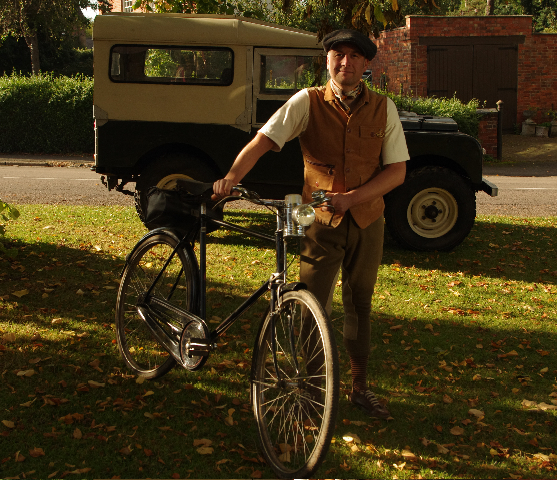 Glenn Anderson – HIGHLY COMMENDED! Glenn Anderson has a deep-rooted connection with Birmingham. Glenn’s background is in the graffiti arts, but now works to produce art from found objects. 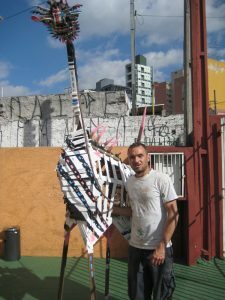 Glenn has represented the city producing art at festivals like Shambala, exhibiting in LA and creating in Brazil. 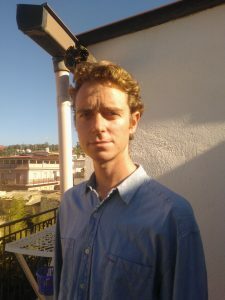 His 3D work hopes to encourage creative thinking and future possibilities. Glenn has built a ‘found’ wooden character, all from discarded objects from in and around the city. Re-jigging and rehashing rubbish and presenting it back to the people of Birmingham in a unique way, the character is thought provoking and a challenges our perceptions of a traditional shop mannequin. 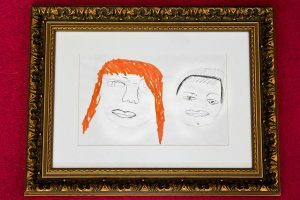 Stitches & Hos – HIGHLY COMMENDED! Sara Fowles of Stitches and Hos holds a monthly knitting hootenanny at the Hare and Hounds pub in Kings Heath. The night set up in 2005 is a social knitting club where anyone can come along to trade tips and tricks, share knowledge and meet people. Stitches and Hos have created knitted chaos at Moseley Folk Festival, covered the pillars of Birmingham Museum and Art Gallery and given the Bullring bull statue a sparkly Christmas jumper. Sara has produced a hand knitted market stall, showcasing the world famous Birmingham markets and all that is available there, in knitted form. Simon Doughty is a designer and commercial sculptor, whose work is about not being confined by gallery space but creating artworks that do not need explaining to an audience. 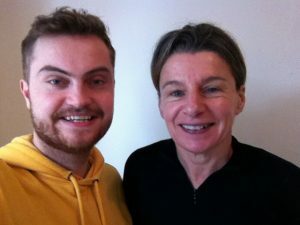 Simon works with the creative and heritage industries to realise their message in sensory tactile sculptures, as well as specializing in working with educational organisations and communities to design & make public artworks. 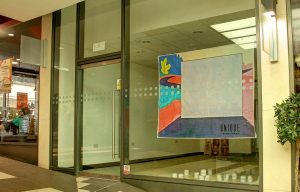 Simon has installed a large scale cut-out and scenic painted sculpture of Birmingham’s cityscape, creating a ‘must’ see display reflecting Birmingham’s independent retailers, culture and creativity. A display of key outfits from the collections of the three winners of this year’s Midlands Fashion Designer Awards at Great Western Arcade. Now in its fifth year, the awards are designed to support, showcase and retain young fashion designers in the city and wider region. 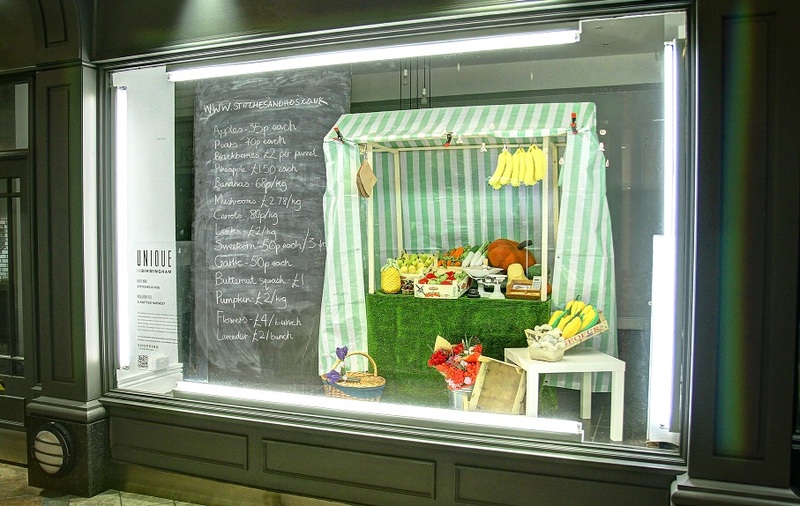 The innovative competition was designed by Retail Birmingham to dress and activate vacant shop units . 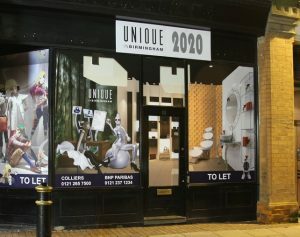 The competitors were asked to interpret the theme ‘Unique in Birmingham’ through the conceptual design of visual displays. 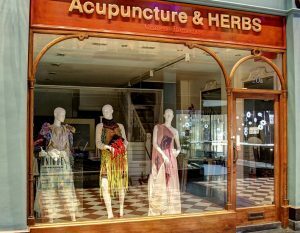 The nine lucky finalists were given £1,000 each towards their installation, funded by a grant provided to Retail Birmingham by Birmingham City Centre Partnership (BCCP).